Our Information Security Strategic Framework assists Security Leaders, CIOs and other C-level executives in assessing, redesigning or establishing Cyber Security Strategic Roadmaps, Target Operating Models and Governance Frameworks. > Information Security Assessments: At the heart of our practice is our independent approach to Cyber Security Assessments which is aimed at engineering true transformational dynamics and is often the first step in any engagement. 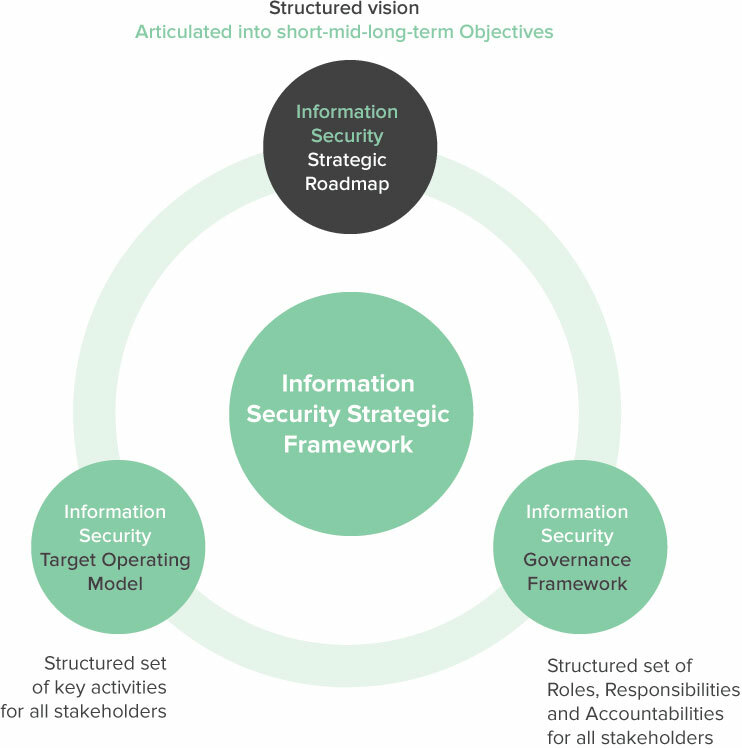 > Information Security Strategic Roadmaps: A structured vision articulated into short-mid-long-term objectives. > Information Security Governance Frameworks: A structured set of roles, responsibilities and accountabilities for all stakeholders. > Information Security Target Operating Models: A structured set of key activities for all stakeholders. We also assist our Clients over the mid- to long-term in the independent supervision of Security transformation programmes, and the architecture and design of Security Solutions focused on process as well as technology – to deliver Information Security Governance best practice and compliance with regulations. Effective Information Security Governance must involve the proper management of all the activities which an organisation needs to carry out in order to maximise the protection of the information it processes. It should ensure the protection of key information assets from relevant threats. This is achieved through the layered application of the right controls – at people, process and technology levels – while managing any element of risk that may result from the absence or inefficiencies of these controls. With the increasing demand for organisations to ensure that they are properly protected from cyber threats, it is key for any activity aimed at addressing Information Risk Management to remain focused on ensuring that the appropriate controls are in place and effective at all levels to protect the organisation from these threats. An effective Information Security Practice provides a common Controls framework across IT and the Business for all parties to operate within, i.e. an Information Security Governance framework in which each party has a role in ensuring that effective Information Security is in place to protect the organisation.